In this series, we sit down with our teachers and ask them about their experiences teaching at BASIS Independent Fremont, what motivates them, and some other fun questions. Today we talk with Mr. Michael Barbarino, our Music Subject Expert Teacher. I enjoy working in a collaborative environment. BASIS Independent Fremont encourages teachers to work together so students can see the connection from class to class. BASIS Independent Fremont also allows teachers to have autonomy in the classroom. 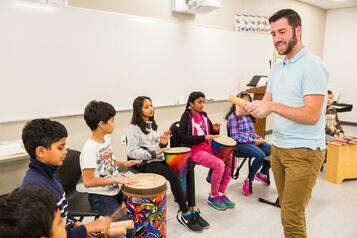 I enjoy being able to teach using materials I think are best suited for music education. c comes in all different forms and we should respect all types of music. For International Day, one 5th grade element sang the Mexican folk song “De colores.” At first, the students were intimidated by singing a song acapella (without accompaniment) and in a foreign language. The week of International Day, I could hear students singing the song confidently throughout the school. Outside of teaching, I spend a lot of time hiking in the mountains or you can even find me doing some urban hiking through San Francisco. I decided to move to California from New York with nothing but a dream of building a new life in a new place. I would say I accomplished that goal! I began music at a later age than many of my peers, but my passion for music began instantly. From a young age I wanted to teach students to love music and appreciate all it has to offer. Music has become a part of everyone’s life. There is music in movies, stores, restaurants, and even in our own heads! Music is a universal language used since man first appeared on the planet. If all of the music in the world disappeared, each person in the world would feel like something is missing. I love to read the Chronicles of Narnia. I bring out these books every year to read because it brings me back to my childhood and the wonderful memories it holds.